"December 13, 2006: Results of a new study show that, under the right policies, utilities can incorporate wind power into their resource portfolio, comprising up to one-fourth of their delivered energy, without sacrificing reliability and with minor costs for absorbing the wind...."
There has been some discussion lately on CBED and school wind projects. For my own edification and maybe other's, I'd like to throw out a question that may generate some controversy. Basically, my concern is that the myriad of small community wind projects popping up around the state driven by CBED may pose a problem in achieving the ultimate goal of getting 20 percent or more of our electricity from renewable energy. I'm thinking mainly in terms of transmission planning and grid integration isues. Since wind projects can be built much quicker than transmission lines, transmission planners may have a hard time connecting the dots when there are a lot of small dots compared to a few large dots. As far as integration issues, utilities will need greater control of wind farms once they start to make up a large portion of the electricity generated. For instance, utiltiies need to be able to disconnect wind farms from the grid to do line maintenance or when power output is exceeding line limits due to high winds. Wind farms will also soon be bidding on the MISO market (now they are simply negative load). It seems that it would be harder for utilities to monitor and control a myriad of small projects versus several large wind farms of 100 of megawatts or more. Plus, the bigger the wind farm, the cheaper the electricity due to the economies of scale involved. Utilities may be reluctant to purchase higher priced electricity from small wind farms if policies like the Production Tax Credit go away. Anyway, I just thought I would throw this out there to see what people think. Hopefully someone more knowaledgable can set me straight. It looks like Macalester is not the only school interested in making money from renewable energy. The Free Press has a story about the St. Peter School District and a potential wind investment. This must be a C-BED project much like the Macalester College one Timothy discussed previously. I have to think that C-BED is a great opportunity for schools looking for a dedicated source of funding for the future. I'm glad to see people taking advantage of it. I know there's been some interest around Minnesota's Community-Based Energy Development (C-BED) program, a state-mandated project by which utililities sponsor projects (by buying the electricity through a special front-loaded structure) that have primarily community ownership along with equity investment. This initiatives was developed to spur the development of community-owned renewable energy (primarily wind and biomass) in Minnesota. Last February, a new round of C-BED projects, Xcel Energy, the largest provider of projects, committed 300 MW of installed C-BED projects by 2007, and a total of 500 MW by 2010. This forms a large part of the target of 800 MW the state is aiming for. More info on the C-BED program can be found at www.c-bed.org. The Macalester Clean Energy Revolving Fund (CERF), a Macalester fund I started with a couple of friends last year and managed by a board of two students, a faculty member, and administrator, and an alumni, is in the process of entering a C-BED project for a 2 MW wind turbine. CERF is committed to investing in efficiency and renewable energy projects generated by the campus community (primarily students working with others) that are financially viable through cost-savings and revenue generation, thus sustaining and growing the fund for yet more initiatives. Started with $27,000 of student government and Environmental Studies department funding last spring, and recently augmented with a $40,000 comittment from the administration, CERF is starting its operations with a moderate degree of funding, but is obviously focused on projects that will allow it to grow considerably to provide more substantial support in the future. The C-BED system appears to be an excellent way to embark on major projects from this degree of funding, which is similar to that experienced by many farmers or other rural developers who may want to participate in the wind business. As an independent fund under Macalester College, CERF is covered under Macalester's 501c3 status, which fits the requirements of C-BED participants, that they either be Minnesota residents, or Minnesota 501c3 non-profits (there are some other categories including public schools, native American groups, etc.). While not the typical member of such a C-BED deal (most are citizens or families), CERF does face a very similar process. The contract is not yet secured; this will require both approval by the college treasurer (the one downside of being under Macalester, since while they love the idea, they must of course deal with the liability hazards even though the funding is provided by CERF), as well as review of some basic documentation under development. However, I'll try to give a brief background of what has happened/ what we think will happen. We learned about C-BED through our initial research into industrial scale wind turbines last fall and through the guidance of Jeff Paulson, a renewable energy lawyer who is helping us with this deal pro bono. The idea is that CERF, as the community partner in the C-BED project provides a small investment in the 2MW wind turbines being slated for production - roughly 1% of entire development/ construction costs. For the 2MW turbines widely being considered (likely Suzlon-88 models (Suzlon is Indian)) construction costs are ~$2.7-2.9 million, so 1% is $27,000-29,000. An equity investor would cover the remaining cost for a majority of the initial revenue. Jeff helped us identify a turbine project among those he was involved in and eventually identified a project in Stevens County MN with 10 turbines, one of which is potentially the CERF wind turbine. A local wind energy developer created West Stevens Wind, a blanket Limited Liability Corporation (LLC) to manage this project and negotiated the Power Purchase Agreement (PPA) with Northern States Power (Xcel Energy). The final contract for the PPA through a C-BED financing structure for the 10 turbines in this project is soon to be released. C-BED is structured to provide high-return rates in the first 10 years (when debt service and equity return needs are the greatest). Since most debt financing structures have 10-year lengths, many turbine projects have very low profits in the first 10 years after which profits spike substantially (less useful for the owner). Most turbines sell electricity to large utilities at around 3.3 cents/kwh. C-BED introduces a front-loaded pricing system using a concept called Net Present Value - I'm not economically savy enough to understand quite what this means - set at a maximum of 2.7 cents/kwh. While this sounds low, the actual effect is that electricity rates are quite high in the first 10 years (somewhere from 5-6 cents/kwh, though we haven't seen the PPA yet) which then drops dramatically after the first 10 years (to around 3 cents/kwh) and then rises slowly after that (basically inflation). To make the first-10 years even more profitable, C-BED projects are also eligible for the federal Production Tax Credit (PTC) which I think is currently at 1.9 cents/kwh (it is 1.5 cents/kwh scaled to inflation) since the equity investors are usually large corporations with a tax load. Furthermore, depreciation benefits can accrue in initial years. Wind PPAs are generally made on 20-year periods, although the life of the turbine could be longer. Each community owner can own only up to 2 turbines through C-BED, so a 10-turbine system like this one includes a number of different C-BED owners: our project would consist of 8 LLCs, 2 of them owning 2 turbines and the other 6 (including ours) owning 1. Initial investments in project development are fronted by the community partner for MISO studies (analyzing transmission costs), and verifying wind potential, but are counted towards the total 1% of project costs. Once the PPA is negotiated, participant owners (like CERF) form independent LLCs under the central West Stevens Wind LLC. LLCs reduce liability to basically the investment in the project and are managed by a Board of Governors - in this case since the entire West Stevens Wind would also have a Board of Governors composed of the component LLCs and the equity investor in the entire project (who wants to deal with as few members as possible, it is likely that each LLC will only have 1 Governor, who in our case will most likely be a member of the CERF Board. After the community partners are collected, the equity investor (possibly Mission Edison, a subsidiary of Edison Electric, in our case) joins to finance the majority of the project. The equity investor will recieve 99%of revenues, tax incentives, depreciation benefits etc. initially (assuming 1% community partner ownership in ech of the turbines). The equity investor sets a target return - this is estimated to take 8-12 years to pay off depending on the wind, after which point majority ownership will flip to the community partner - somewhere in the range of 80-95 % ownership, and subsequent revenues will be split along those lines - an excellent deal considering that the initial investment was only ~$30 k.
In addition to the initial 1% of revenues that the community partner recieves, they also recieve a management fee since they are responsible for the management of the turbine, though the cost of maintenance is usually already accounted for - the way management responsibilities were phrased was it would be keeping an eye on the turbine and if it stopped working calling to get it fixed. Also, since there are 10 turbines together, it is likely that one local manager would manage all of them on the ground supported by the constituent LLCs, the lead developer of the project may do this. The management fee could be anywhere from $12,000-30,000, which though a big difference, is all within the range of short-term profitability (payback within 1-3 years even if there are some costs, which should again, be minor). The expected revenues of each turbine would be somewhere in the range of $300,000 annually for the first 10 years, with possibly up to another $100,000 in tax credits and depreciation benefits, and aroun$150,000 annually thereafter. Again, the initial stream would primarily go to the equity investor. Next steps after the PPA is finalized are forming the LLCs (hopefully including CERF) that will make up West Stevens Wind, conducting the initial development studies, and then negotiating with the equity partner before finalizing leases (each turbine will also provide several thousand dollars for the quarter-acre of land they lease to the local owners), and moving towards construction. This project is scheduled to be constructed sometime in fall 2007. Nearly all of the currentC-BED projects will be up and running by the end of 2007 because at the end of 2007, the PTC (Production Tax Credit) expires. While there is strong hope that the PTC will be renewed at the federal level, project developers are careful to get the project generating energy by the end of 2007, since if by some chance it is not renewed, the project will be much less succesful. Any project that is generating electricity by fall 2007 will recieve the PTC for the first 10 years of production whether or not the PTC is renewed. The community partner does get a share of the tax credits, which in the case of CERF may be usable by Macalester College for taxes on property rentals, but since most or all of the first 10 years is majority equity ownership, this does not make a sizeable impact on the community partner. I think it's pretty clear that this is an excellent deal for residents and non-profits in Minnesota. The most common reaction I've gotten from people is 'where's the catch', it sounds too good to be true. The actual system seems pretty solid, C-BED keeps account of the millions C-BED is already funnelling into MN's economy. The only downside I can see is where it came from: C-BED was negotiated as part of the Xcel nuclear dry-cask storage agreements - as was Xcel's wind mandate. It is a great opportunity to jumpstart community-owned energy! Well, that's a rather long descrip, but I hope it gives a good idea of how C-BED projects actually work - at least as I understand it. I'll send an update when we make more progress towards our C-BED turbine. I attended the Renewable Energy Workshop today sponsored by the U of MN Electrical Engineering Department. As expected, it was largely technology-focused, with some general discussions of the challenges facing renewable energy here and elsewhere. (And a good buffet style lunch). Here a few salient points of the talks I attended. The speaker talked about his research into superconducting transmission lines. The idea behind the project is to supplement our existing grid with a network of underground high voltage DC transmission lines made with superconducting material. The benefit of using superconductors is that the current density can be much higher, so fewer transmission lines have to be built. Line losses would also be minimized. Each line would consist of a superconducting core for carrying the electricity with an outer ring of liquid hydrogen, which would act both as a coolant and an energy storage mechanism. During times of low electricity demand, excess electricity from renewable sources would be used to create the hydrogen via electrolysis. Though such a grid is technically feasible, cost is a major issue, though the speaker was quick to note that anything transmission related is expensive. He quoted a figure of roughly $2.5 million per mile to install these cables. Water scarcity may also be an issue in some places. This talk mainly focused on the challenges facing Norway in meeting its future electrical demand and making use of its vast renewable energy potential (enough to supply twice that of its current annual consumption.) Currently, 99% of Norway's generation comes from low cost hydropower. However, similar to here, demand is outpacing supply. More supply will have to be brought on in coming years. I was struck by how similar the challenges facing renewable energy are to here - public resistance (in the case of wind), cost (wind energy is still more significantly more expensive than hydropower), and political uncertainty (will subsidies continue?) Norway is also facing transmission limitations, just like here.Especially of note is that public resistance to wind energy projects has increased in recent years, for all the typical reasons - avian mishaps, other wildlife impacts, and aesthetics. I was mostly impressed by GRE's goals to reduce its CO2 emissions to 2000 levels by 2020, as well as doubling its renewable objective of 10%. The speaker admitted that meeting the first will be extremely challenging, to say the least. The speaker talked about how wind turbine technology has advanced over the last 20 years and how wind energy continues to grow rapidly in the US and elsewhere. He also provided a nice summary of the recent situation with the Dept of Defense blocking new wind farms due to concerns over radar. The report finally came out on Sept. 27, 143 days late. It didn't really say anything that could not have been written in one day - only that wind farms can interfere with radar. It didn't offer any mitigation measures to help current or future projects move forward. Sounded like a great use of taxpayer dollars. The CapX project is an ongoing transmission planning project involving all major utiltiies in Minnesota, planning transmission needs through 2020. I already knew how long this process takes, but the uninitiatied would probably be shocked. Though, there are good reasons it takes this long. The Certificate of Need process for the first group of lines, mainly to improve reliability, alone will take through 2008. Then route permits have to be aquired, which will take through 2010. During this time, lots of meetings are held with city governments, landowners, and other agencies. The proposed Brookings -SE Minnesota line alone will require that 200,000 landowners be notified. This is just a massive undertaking. From what I've heard, the last round of tranmission construction was an extremely drawn out and painful process. It will be even worse this time around, due to the industry restructuring that has occured since then. Now, independent power producers can bid in new projects to the MISO queue. Most of these projects fail to get off the ground, since banks won't supply the financing until a power purchase agreement is signed - a chicken and egg problem - meaning that planners don't know where new generation will actually be. Ned gave an overview of renewable energy-related research in the EE department, then talked mainly about a matrix converter his research team developed. The converter can be used with any variable speed generator, including wind turbines and will boost power output by 1.5X of nameplate ratings. This would also eliminate the problem of bearing currents in typical motors, which eventually destroy the bearing and represent a major maintenance headache. Ned also talked about the benefits of using silicon carbide (SiC) in power electronics, which improves device performance by 10-100 times over plain silicon (Si). The cost of SiC continues to fall, making the use of this material more feasible. When one has made a decision to kill a person, even if it will be very difficult to succeed by advancing straight ahead, it will not do to think about doing it in a long, roundabout way. One's heart may slacken, he may miss his chance, and by and large there will be no success. The Way of the Samurai is one of immediacy, and it is best to dash in headlong. So Al Gore’s speech at NYU on September 18 got me thinking about Distributed Generation. For those who haven’t read it yet, an archived webcast and the full text can be found here. It was a terrific speech, by the way, and I could occupy a lot of space praising it, but that wouldn’t be very interesting. After all, you probably liked it too. But it was one issue that got me thinking, and which gave the impetus for this post. What I really want to talk about today is Distributed Generation, or DG. Gore gave voice to some ideas that are very widespread among left-leaning energy advocates, and many of those ideas deserve closer consideration. I’m using this post to flesh out some of my critiques of the idea of Distributed Generation. Fundamentally, in reference to the quote above, I think DG advocates are setting out to solve the wrong problem. Our problem is not large-station electricity generation, our problem is climate change and energy security. Its my feeling that in dealing with climate change we are likely to deploy carbon-neutral energy technologies using the same large station (or refinery) production and distribution model that we use right now. Distributed generation is a new trend in the generation of heat and electrical power. The Distributed Energy Resources (DER) concept permits "consumers" who are generating heat or electricity for their own needs (like in hydrogen stations and microgeneration) to send surplus electrical power back into the power grid - also known as net metering - or share excess heat via a distributed heating grid. Here’s what Gore says on the subject. Today, our nation faces threats very different from those we countered during the Cold War. We worry today that terrorists might try to inflict great damage on America’s energy infrastructure by attacking a single vulnerable part of the oil distribution or electricity distribution network. So, taking a page from the early pioneers of ARPANET, we should develop a distributed electricity and liquid fuels distribution network that is less dependent on large coal-fired generating plants and vulnerable oil ports and refineries. So the main point of DG is that we rely more and more on homes and businesses producing their own electricity, and possibly selling electricity onto the grid and less and less on large station power generation (how we, by and large, do things now). Gore extends DG to include distributed (presumably somewhat larger scale) biofuels production as well. The main arguments are security (Gore’s argument), greater energy efficiency through the use of combined heat and power, and economic/self-reliance benefits (producing your own power, yeah!). I think a lot of DG advocates miss some glaring problems. One problem with DG is that it would rely on small-scale power generation. This is actually put forward as one of the main BENEFITS of DG by many advocates. What these advocates miss is that the economics of energy production are absolutely dominated by economies of scale. Let’s use wind as an example. A 1MW turbine produces cheaper electricity than a 200 KW turbine. And a large scale project produces cheaper electricity than a small scale project. The reasons for this are fairly intuitive. There are a lot of fixed costs that must be paid whether you’re building a large project or a small project – feasibility studies, wind measurement, planning, running around securing financing and power purchase agreements, paying to secure all of the cement manufacturing capacity in your county to pour the bases for the towers, etc. A larger project produces more kWhs, and the fixed costs can be divided over more kWhs, making the levelized cost of power cheaper. But if you don’t believe me, you can use NREL’s online Wind Energy Finance Calculator. To prove my point, I calculated the real levelized cost of energy for a 500 kW project (small), and for a 100 MW project (200 times bigger). I used all of the default assumptions, and only changed the size of the project. So the electricity from the small-scale project is about 60 times more expensive, give or take. Its also about 6 times more expensive than retail grid electricity at about 7 cents/kWh. So in asking people to adopt small-scale distributed wind, we’re asking them to pay a LOT more for electricity than they would pay for grid electricity. Note also that, according to this calculator, a large scale project sells electricity that’s probably cheaper than even WHOLESALE electricity. Economies of scale differ for various energy technologies, but are almost always a factor. The optimal size for pulverized coal plants, for example, is on the order of 1000 MW or larger. Gas turbines burning natural gas or fuel oil have low capital cost, and are therefore more economical at small scale. But because the levelized cost is more expensive then large station power, and they can be quickly ramped up and down, they are typically used only for peaking power. Solar power is also cheaper at scale. Home or business scale photovoltaic panels produce electricity at around 20 cents/kWh (around 3 times higher than retail electricity). Only large-scale concentrating solar can produce electricity at anywhere near retail rates. I could go on and on. The fact is that I can’t point to a DG technology that delivers electricity at a rate that is cheaper than, or even close to, the cost of grid power. Economies of scale aren’t going away. If we have a limited amount of money to spend, as a society, on dealing with climate solutions, the cost of individual solutions must be a factor. Until we see the new cheap solar panels or fuel cells that we constantly hear are 6 months away (how’s that for a “Friedman”?) may not be able to afford the deployment of DG on a large scale. Another damning aspect of DG is that it may mean giving up most of our greatest renewable energy resources. Renewable energy resources like wind, solar, and biomass are not uniformly abundant around the nation. And, unfortunately, many of the best resources fall far from population centers. To stick with the wind example, taking advantage of the vast wind resource of the Great Plains likely means building large transmission lines connecting the wind resource with the potential users of that wind energy (or building large hydrogen pipelines, or building infrastructure for some other energy carrier). This is true for biomass as well. In urban areas, where most energy is used and most people live, there are serious limits on the potential biomass supply. Take the Twin Cities as an example. There is a famous district heat project in St. Paul (District Energy) that has recently switched from coal to biomass as an energy source. Other projects are being planning, including Rock Ten and the south Minneapolis project formerly run by the Green Institute. Those projects are reportedly having great challenges in finding a sufficient supply of biomass because District Energy has secured much of the available supply of urban wood trimmings and the like. So we’re reaching the limited of the DG biomass potential in the Twin Cities, and supplying only a small fraction of the metro area’s biomass needs. Utilizing the country’s biomass supply on a large scale probably means having projects in rural areas – with cheap land, fertile soil, and lots of biomass, and transporting products like cellulosic ethanol to demand centers. This will likely be wonderful for rural areas, but its not DG. Solar energy may one day be an exception to this, but right now economics and the efficiency of panels stand in the way. My point is not to argue that DG shouldn't be done. I think there are many niche applications for DG. In rural areas and small rural communities, for example, there will be applications for Distributed Generation from renewables, possible in combination with combined heat and power. I know some people who are very excited about their rooftop solar panels, and they don't really care that they're paying a lot for the electricity. I also think that there are credible scenarios under which DG could play a larger role in our energy system, provided there are some really fundamental technological innovations. I think that the vision of mass-produced, highly efficient, renewable DG technology, similar to Personal Computers, is pretty exciting to contemplate. But lets not fool ourselves. This kind of thing is a ways off, whereas there are a variety of large-scale carbon-neutral technologies that are commercial or near commercial and could be deployed over a relatively short time frame. There are many energy advocates who feel that large station electricity generation is bad by its very nature. There are some who offer DG as an alternative, and even use the DG alternative as a rationale for fighting new transmission and new large energy projects. In the MN legislature last year there was infighting between those who wanted only community, small-scale wind development and those who wanted 20% renewable energy standard which would require a lot of large-scale projects. All that said, I think that macro-scale analysis of power generation technologies, resources, and demands, will reveal that DG is likely to play a small role in the near term. DG can't be used as an excuse to fight large carbon neutral energy projects. I welcome comments, and hope this starts some discussion. The "Coalition for Affordable and Reliable Energy" (CARE), a coal lobby marketing firm, has decided that laptop discoveries about coal will incite women to shriek out loud about "American Energy". No spontaneous support shrieks have been reported on the Washington DC metro, where the advertisement is running. 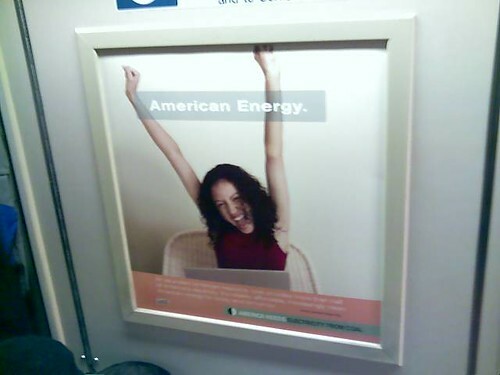 There is a lot of support for "American Energy," including "American Energy Independence," "American Energy Security," and my favorite, "Americans for American Energy" (as opposed to Russians?!). The biggest "American Energy" front runners are wind energy, biofuels, and coal. No word yet on whether the European wind energy industry is thinking of changing their name in light of this development. 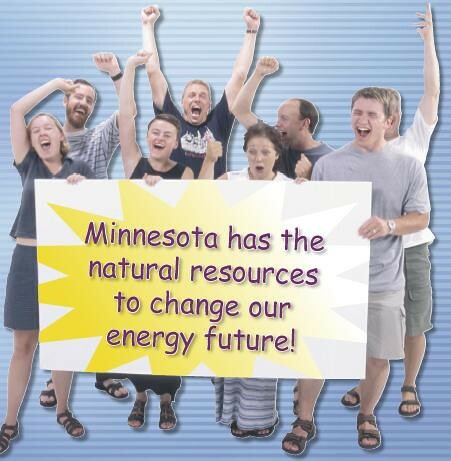 Minnesota energy historians may remember a similar "energy-excitement" marketing genre from the Padilla Speer Beardsley marketing firm (lesser known as Vanilla Pears and Birdseed), which was hired by the MN Department of Agriculture for their 2004 MN State Fair booth, which featured renewable energy. Nothing says stereotype like white people in birkenstocks (and that lady second from the right is really whooping more than shrieking). And no marketing campaign is cheaper than when you gather everyone in the office for the main photo op. No word on whether the Dept of Ag feels shorted that they weren't invited to be in the picture. Contrast that with the opposite trend for this Latin American wind energy campaign. Now we're talking enthusiasm. There's a wind turbine. There's a guy. Wind energy. Details of the emerging energy marketing genre wars are unknown at this time, but will no doubt be vetted in future advertisements at other random locations where people are fairly oblivious to the point. This slipped by me last week. The FAA has given the go ahead for development of wind energy projects in Southern Minnesota. The issue is not entirely dead, though, as the investigation continues on other projects. The Cape Cod off-shore wind energy project is still waiting for FAA approval.